1. Faceted search with price range slider module. 2. 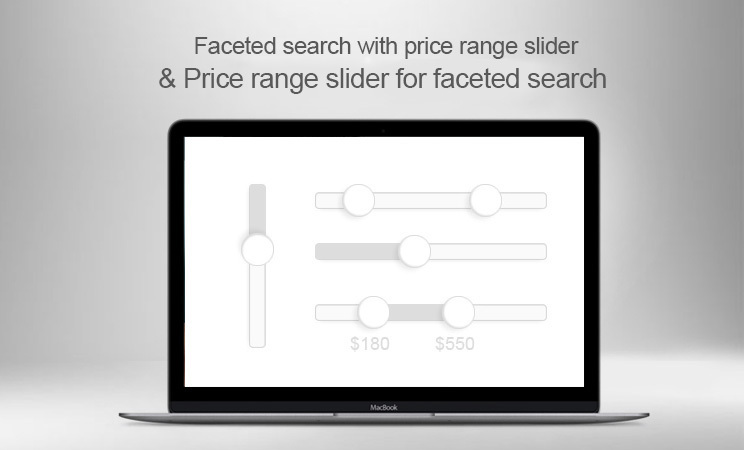 Price range slider for faceted search module. They are two different modules, the main feature of them is the same to add price range slider and weight range slider to the faceted module. 1. Price range slider and weight range slider. Improved the native behavior of Faceted search module to make price range slider and weight range slider work along, they won’t disappear after filtering products using them. 1.5. Range slider for some attributes and features [NEW] [BETA]. If values of a attribute or a feature are all in the same format (Number+Unit or Unit+Number), then the attribute or the feature can be displayed in range slider. Here are some examples. Attributes and features like these can’t be displayed as range slider. To use this feature, you just need to set “filter type” for filters to “Range slider”. For transformer theme and panda theme users, upgrading your transformer theme to v4.3.1 and panda theme to v3.4.1 is required to use this feature. 2. Range sliders with inputs. Give another way to customers for them to set precise values to filter products. 3. Range sliders with tooltips. Show currently values in tooltips, a quite fancy way. If you have a wide range of price and weight, then vertical range sliders would be a good choice for you. Because general range sliders are place on the left column, the width for sliders is limited. You can set the height of vertical sliders to make them be as high as you need. 5. Predefined range slider styles. With two price defined range slider styles: Square handles and round handles. Several options to change colors and sizes. By default, sliders slide fluently. In order to make the handles jump between intervals, you can use the step option. If example if you set Step to 10, then sliders will go like this 0-10-20, if you set Step to 0.5, then sliders will go like this 0-0.5-1-1.5. This module can be installed easily, no matter which theme you are using. Customizable sliders (Colors and sizes). It’s a modified version of the native Faceted search module of prestashop 1.7. It doesn’t edit any theme files. Check #10 on the “Documentation” section below. Why there are two modules, what’s the main difference of them. To change those behaviors requires to edit the “Faceted search” module, that’s why the “Faceted search with price range slider” module was created for, it improves the native behaviors of faceted module to make things be nicer. They can be installed easily without editing any files in most cases. View videos above to see how to install. The way of how to upgrade is the same as how to install. 1. Range sliders don’t show out after installing & configuring the “Faceted search with price range slider” module. Click on the “Register this module to the displayHeader hook” at the bottom of “Faceted search with price range slider” module’s configuration page to register the module to the displayHeader, and then try again. 2. After installing the “Price range slider for faceted search” module, range sliders don’t show out. 3. Do I need to clear the Smarty cache and browser cache after installing them. 4. Can I upload files of the “Faceted search with price range slider” module to the /modules/ folder to override files of the original “Faceted search” module. Yes, you need to click on the “Register this module to the displayHeader hook” button in the module after uploading files. But that’s not recommended. 5. If I buy the “Faceted search with price range slider” module, will I get the “Price range slider for faceted search” module too. No, they are two different modules, you get what you buy. 6. Can I upgrade the “Faceted search with price range slider” module when it shows an “Upgrade” button. No, never update the “Faceted search with price range slider” module from prestashop, otherwise changes we did to the module will disappear, price & weight range sliders will gone. When prestashop team updates the “Faceted search”, we will update the “Faceted search with price range slider” module too, you use the update from us to update your “Faceted search with price range slider” module. 7. If I use the “Price range slider for faceted search” module, can I update the “Faceted search” module when it shows an “Upgrade” button. 8. What’s the loading effect on demo sites. That’s added by one of our free prestashop modules called Free Beautiful Preloader module for prestashop 1.7. 9. How can I check the version of Faceted search with price range slider module. You can find its version number at the very bottom of it configuration page. 10. Compatibility of the Faceted search with price range slider module. Compatible with Prestashop’s Classic theme, Transformer theme 4.2.2 and later, Panda theme 2.3.2 and later. May need integration to be compatible with other highly customizable themes, we can provide help of that for free. (1)With several small modifications, it can be compatible with Warehouse theme, contact us, we will guide you. (2)To be compatible with Alysum theme, check the /integration/alysum folder in this module to see if there is a folder for your version, if yes, then copy the facet.tpl in the folder to replace the /modules/ps_facetedsearch/views/templates/hook/facets.tpl file. If no, you need to edit the /modules/ps_facetedsearch/views/templates/hook/facets.tpl file, contact us, we will guide you. (3)It doesn’t compatible with “Show Products by Attributes” module. 11. If your site is running on a child theme. You need to copy the the /themes/(parent theme)/templates/catalog/_partials/active_filters.tpl to your child theme. 12. How to integrate the “Price range slider for faceted search” module with “Advanced SEO Friendly URLs”. Fixed a problem which would occur when use percentage discounts. Fixed a problem which would occur when use tax included discounts. Fixed a native multi-store support problem of the facet search module. Fixed another native problem of the facet search module when filtering product via tax included prices. Fixed a native problem of the facet search module which would cause small prices not showing out. Fixed a problem of dropdown menus not working. Added possibility to use range slider for some attributes and features. Fixed a minor problem of Faceted search module, the problem causes products not showing out when stock management is disabled. Upgrade faceted search to 2.2.1. Fixed a minor compatibility problem with IE. Fixed a problem of products out of price filter range showing out. Fixed a problem of limit setting for filters not working. Fixed a typo in 1.0.7, the typo which would make this module stop working. Fixed a problem of empty filters showing out. Upgraded from 2.1.1 to 2.1.2. Improved this module to make range sliders work when prices don’t have decimals. Added compatibility with Alysum theme. Fixed a problem of filters not showing out when ranges are small. Fixed a problem of filter values changing automatically. Improved the feature of setting values using inputs to accept values without decimals. Added “Step” options for sliders. Fixed a problem with inputs. Fixed a problem of active filters missing. Show checkboxes instead of sliders if something goes wrong to make sure filter feature always working. Added compatibility with warehouse theme. All that I wanted, great support. Works like a charm on my site, way better than the tidiours radio buttons, thanks.